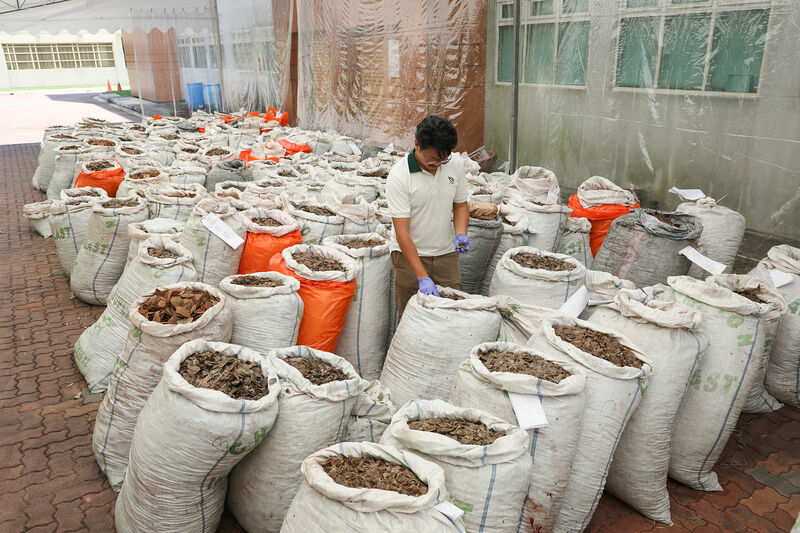 The local authorities seized 12.9 tonnes of pangolin scales worth $52.3 million at Pasir Panjang Export Inspection Station on Wednesday - the world's largest such shipment bagged in a single haul. The shipment originated from Nigeria and was bound for Vietnam. The scales were found in 230 bags tightly packed inside a 40ft container, hidden behind packets of frozen beef, which the container had been declared to contain. Along with the pangolin scales, the authorities seized 177kg of cut-up and carved elephant ivory worth $120,000 during the inspection. Singapore Customs and the National Parks Board (NParks), which staged the joint operation that led to the haul, said the scales are likely from 17,000 pangolins, taking into account the weight of various species. The four species native to Africa are the giant ground pangolin (Smutsia gigantea), the black-bellied tree pangolin (Phataginus tetradactyla), the Temminck's ground pangolin (Smutsia temminckii) and the white-bellied tree pangolin (Phataginus tricuspis). 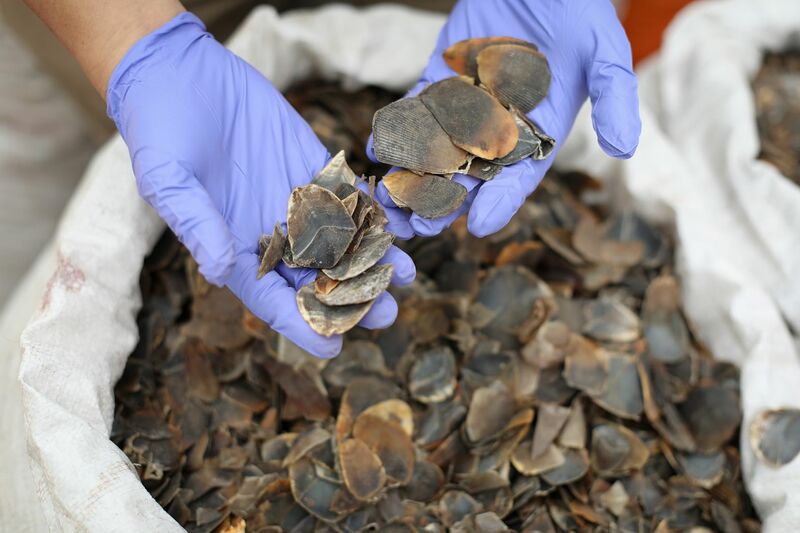 The previous biggest haul on record was in China in 2017, where close to 12 tonnes of scales were seized. Ms Anbarasi Boopal, deputy chief executive of Animal Concerns Research and Education Society (Acres), said: "Acres is shocked to see such a huge haul of pangolin products through Singapore. The demand for them needs to be curbed in order to end the suffering of these animals. "Such seizures also show that there is a need for rigorous measures in place to detect early and deter in addition to intelligence and tip-offs." NParks said pangolin scale shipments had previously been intercepted here in 2015 and 2016. The pangolin is believed to be the world's most trafficked mammal. Its scales are in high demand in Asia for use in traditional Chinese medicine despite there being no proven medical benefit from their use. Its meat is also considered a delicacy in some countries. Dr Adrian Loo, group director of wildlife management at NParks, said: "From a conservation point of view, it's very heartbreaking to see so many pangolins were sacrificed for no reason. "The pangolin scales are made from the same material as our hair and fingernails. There's no scientific proof that it can cure the diseases that people think they cure." With the scales of the pangolin deeply embedded in its body, Dr Loo said the animals were likely killed by poachers in the process of removing their scales. "The upsetting part is that 17,000 pangolins are dead because of false beliefs that are not scientifically proven, causing the decline of a very vulnerable species," he said. Singapore is a signatory of the Convention on International Trade in Endangered Species of Wild Fauna and Flora (Cites), which focuses on sustainable trade and the deterrence of illegal trade to protect endangered species. Under the Endangered Species (Import & Export) Act, the penalty for the illegal import, export and re-export of wildlife is a fine of up to $500,000, and may include two years' imprisonment. The same penalties apply to the transit or transshipment of illegal wildlife species, including their parts and derivatives. NParks said investigations are ongoing. It added that the scales will be incinerated after investigations are complete so that they do not re-enter the market.